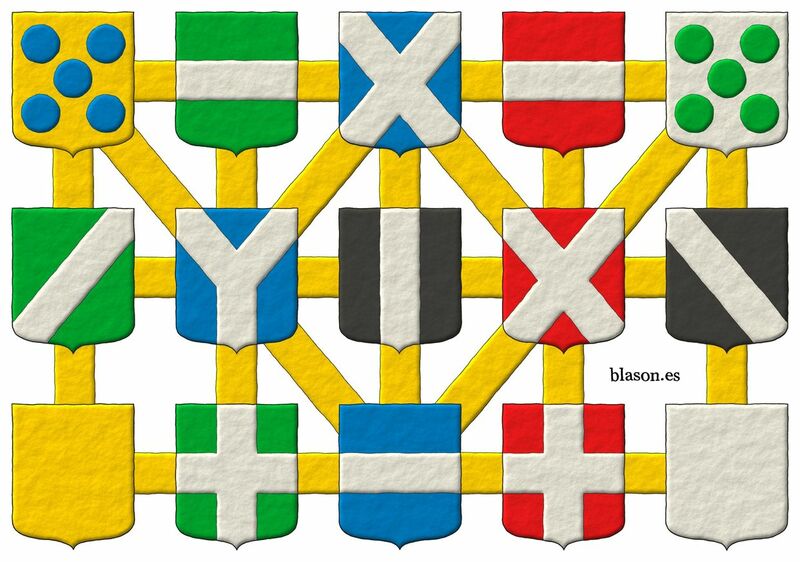 Transform the blazon «Or» into «Or, five Pommes in saltire» and the blazon «Argent» into «Argent, five Hurts in saltire» moving the pommes and hurts through both metals, without breaking the rule of tinctures. You can change one charge by another one, but only once. 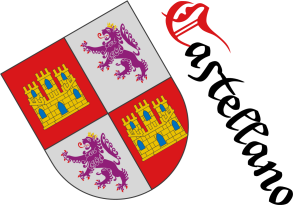 For example, if you change «Sable, a Bend Argent» by «Sable, a Pale Argent», then the Pommes can arrive to «Or» blazon. However, this is not a solution, because the Hurts cannot walk to «Argent» blazon. Think before you move the cursor or click on the following link and see the solution. Categories: Riddle, Pointed and rounded, Outlined in sable, Freehand, Or, Argent, Vert, Azure, Gules, Sable, Hurt, torteau, pellet, pomme and golpe, Hurt, Pomme, In saltire, Fess, Saltire, Bend sinister, Cross, Pale and Bend. 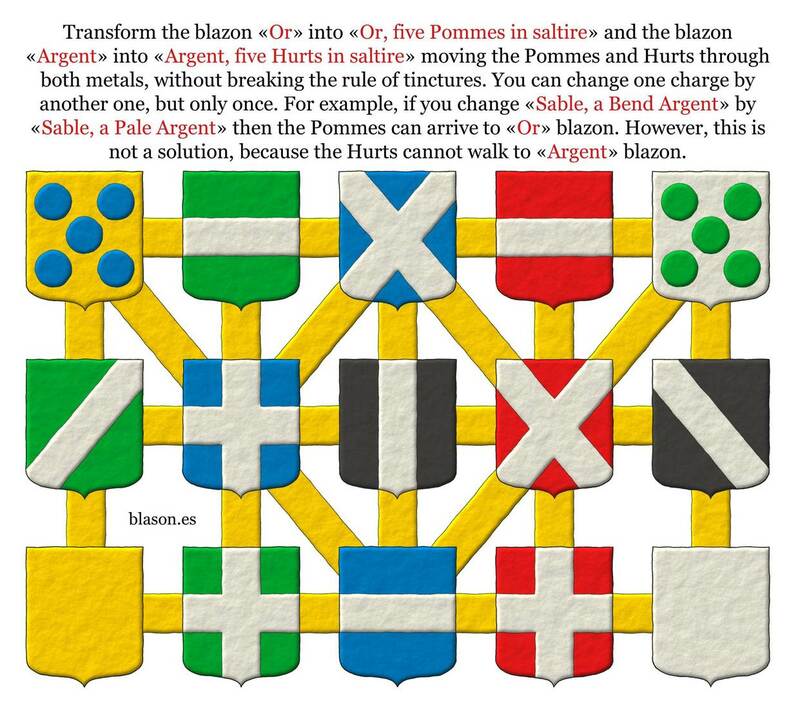 For example, if you change «Azure, a Cross Argent» by «Azure, a Pall Argent», then the Pommes can arrive to «Or» blazon and the Hurts can arrive to «Argent» blazon. You can view both paths azure and vert in the following image. Other solution is to change «Azure, a Cross Argent» by «Azure, a Bordure Argent». Categories: Riddle solution, Pointed and rounded, Outlined in sable, Freehand, Or, Argent, Vert, Azure, Gules, Sable, Hurt, torteau, pellet, pomme and golpe, Hurt, Pomme, In saltire, Fess, Saltire, Bend sinister, Cross, Pale, Bend and Pall. Or, three Fleurs de lis Azure. Or, a Fleur de lis Azure. Or, five Fleur de lis Azure in saltire. Or, two Fleur de lis Azure in bend. Or, four Fleur de lis Azure. 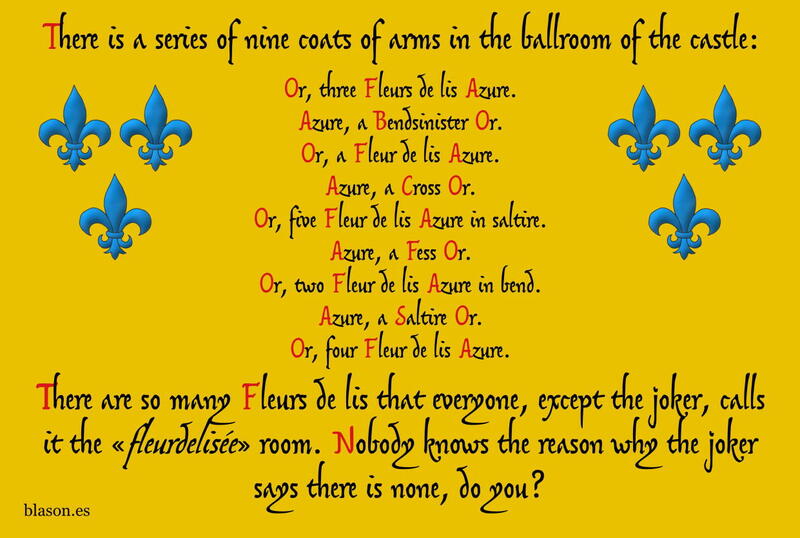 There are so many Fleurs de lis that everyone, except the joker, calls it the «fleurdelisée» room. Nobody knows the reason why the joker says there is none, do you? Categories: Riddle, Or, Azure, Fleur de lis, One, Two, Three, Four, Five, Bend sinister, Cross, Fess and Saltire. Categories: Riddle solution, Pointed and rounded, Outlined in sable, Freehand, Or, Azure, Fleur de lis, One, Two, Three, Four, Five, Bend sinister, Cross, Fess and Saltire. Riddle, Pointed and rounded, Azure, Bend, Bend sinister, Five, Cross, Cross, Four, Outlined in sable, Two, In saltire, Fess, Fleur de lis, Gules, Or, Pale, Pall, Argent, Hurt, torteau, pellet, pomme and golpe, Hurt, Pomme, Sable, Vert, Riddle solution, Saltire, Freehand, Three and One.